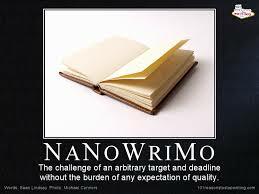 National Novel Writing Month, known as NaNoWriMo, has started on November 1st. The goal is to write a 50,000-word novel in one month. Writers turn off the inner editor and put other projects on hold to be able to meet the word count by the ending date of 11:59 PM on November 30th. The novel is a rough draft and then months, and often years afterwards, the editing goes on and on. I’ve participated since 2005. The last couple of years I didn’t make it to 50,000 words but previous years, I did. Some of the rough draft novels I completed in NaNoWriMo, are Eva in the Haight, Hada’s Fog, Lilli, and Norman in the Painting. The link is below, give it a whirl, and if you have joined this year, good luck.